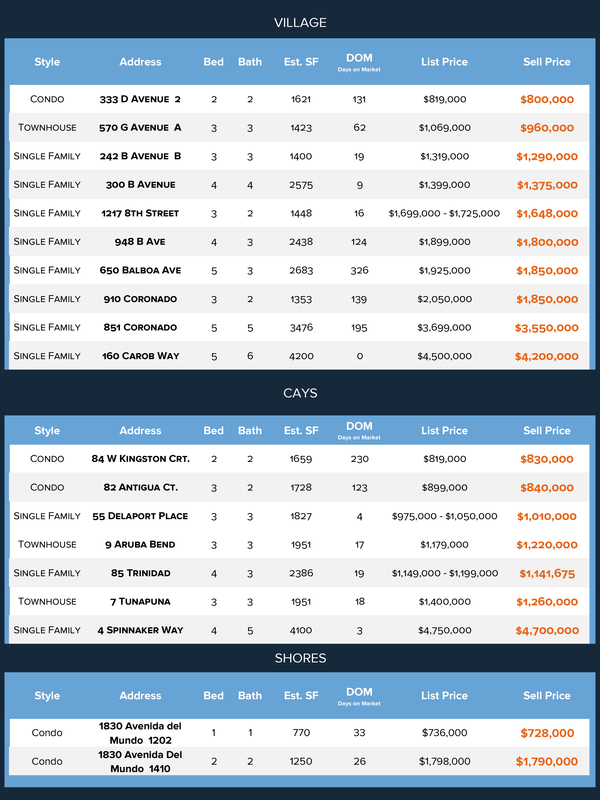 April proved to be another strong real estate month for Coronado. Dipping only slightly from March’s 24 homes sold, we saw 20 homes close last month. With the summer season rapidly approaching, the nation’s most popular house hunting time, it’s not a surprise for interest to slightly taper off in the spring. With that said, we are anticipating a hot summer! Of course, we only mean the real estate market. Marking the epitome of perfect weather, it rarely goes too far above the mid 70’s in Coronado. As the strongest market, the Village saw ten homes close. Eight of the houses were single-family residences with one condo and townhouse each. The Cays had increased interest in April, closing seven properties. It was a fairly even split with two condos, two townhouses and three single-family residences. Both neighborhoods saw prices range from $800,000–$4.7 million, with the majority in the one million dollar price range. The Shores had two condos close with one at $728,000 and the other at $1.7 million. If you’re looking to take advantage of a strong real estate market, give us a call at ParkLife Real Estate. We specialize in the Coronado Island market. While it may not seem important to work with a brokerage that specializes in a single region, when it comes to the Coronado market, local expertise plays a huge role in the ultimate success of your housing pursuits. This applies to both sellers and buyers. Our market varies drastically from neighboring San Diego, as well as other markets in the nation. The reason boils down to one major reason: limited land. In short, we have more demand than houses. This creates a unique dynamic for pricing, as well as increases competition. If you want to make a strong first showing on the Coronado market, partner with the agents at Coronado’s largest boutique agency.